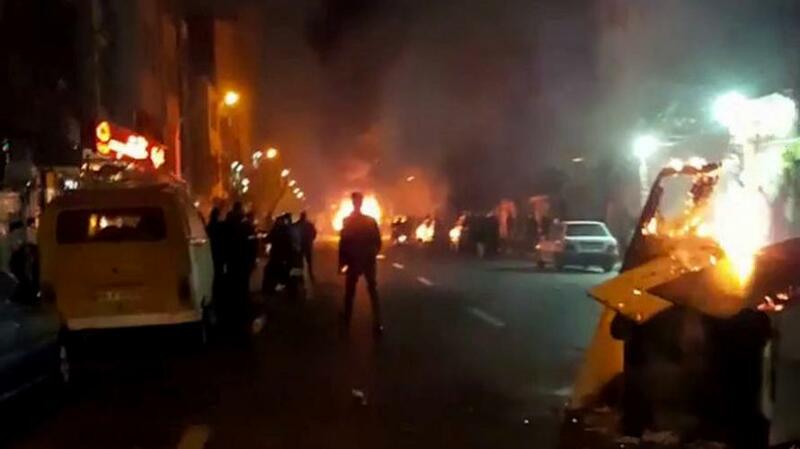 Nine Killed, Hundreds Arrested In 6th Day Of Iran Protests, Supreme Leader Blames "Foreign Enemies"
At least 9 more people were killed and over 100 arrested overnight as unrest and protests across Iran entered a sixth day, the Iranian media reported. On Tuesday, Iran's supreme leader accused “enemies of Iran” of orchestrating the demonstrations and stirring unrest across the country as a crackdown intensified against anti-government demonstrations that began last week. Among the killed were six protesters who had attempted to steal guns from a police station in the town of Qahdarijan, Iranian state TV said, cited by AP. Another two people were killed in the town of Khomeinishahr, and the ninth fatality was a member of Iran’s paramilitary Revolutionary Guard in the town of Najafabad. The overall death toll after six days of unrest has reached 20 people, according to state TV. Meanwhile, about 450 people have been arrested in the last three days, security deputy governor of Tehran Ali Asghar Nasserbakht told ILNA news agency. About 100 of them were arrested on Monday, he added. The arrests accelerated after Iran's Revolutionary Guard took over Tehran security, as reported overnight although according to Naserbakht, the situation in Tehran was under control and police has not asked for the help of the Revolutionary Guards special forces. Having started in the twilight days of 2017, with virtually no warning, pro-and anti-government demonstrations have been taking place in Iran since Thursday. Economic hardship and alleged corruption mostly prompted the anti-government rallies. On Monday Iranian President Hassan Rouhani vowed to double efforts to resolve Iran’s economic problems, unemployment and inflation, Fars agency reported. Later on Monday Rouhani also said that the protests may have been partially stirred up by external forces interested in destabilizing the country. “The enemies of the Islamic Republic of Iran are angry with the glory, success, and the progress of the Iranian nation; and they have vowed to bring the regional troubles to Iran,” he said, according to the Iranian Mehr news agency. Earlier Rouhani stated that citizens are "absolutely free" to protest and criticize the government, but that vandalism was another matter. "Criticism is different from violence and damaging public property," Rouhani warned. Iran’s Supreme Leader Ayatollah Ali Khamenei also accused the Islamic Republic’s foes of instigating the protests. In his first reaction to the unrest, Ayatollah Ali Khamenei said: "In recent days, enemies of Iran used different tools including cash, weapons, politics and intelligence apparatus to create troubles for the Islamic Republic,” he said as quoted by Reuters. Khamenei said on his website that he would address the nation about the recent events “when the time is right”. He did not mention any enemies by name but Ali Shamkhani, secretary of the Supreme National Security Council, said the United States, Britain and Saudi Arabia were behind the recent riots in Iran. Shamhkani described the protests as a “proxy war against the Iranian people”. Ali Shamkhani stated that “Hashtags and messages about the situation in Iran come from the United States, Britain and Saudi Arabia,” according to Tasnim news agency. “Saudis will receive Iran’s unexpected response and they know how serious it can be,” Shamkhani was quoted as saying by Tasnim news in an interview with Beirut-based Al Mayadeen TV. The demonstrations which broke out last week were initially focused on economic hardships and alleged corruption but turned into political rallies. Anger was soon directed at the clerical leadership that has been in power since the 1979 revolution, including Supreme Leader Ayatollah Ali Khamenei, the ultimate authority in Iran’s system of dual clerical and republican rule. Deputy Interior Minister Hossein Zolfaghari said 90% of the detainees were under 25-years-old, showing frustration among youths from the economic situation and lack of social freedoms. Mehr news agency quoted a judiciary official as saying that several ringleaders of protests in Karaj, the fourth largest city in Iran, have been arrested. Iran’s judiciary chief Sadeq Larijani ordered prosecutors on Monday to “punish rioters firmly”. Government spokesman Mohammad Baqer Nobakht said in a news conference that both protesters and the security forces should follow the law. “People have the rights to protest but there is a difference between demonstration and riot...Even those who are confronting the rioters should act within the framework of law,” he said. Videos on social media on Monday showed an intense clash in the central town of Qahderijan between security forces and protesters who were trying to occupy a police station, which was partially set ablaze. There were unconfirmed reports of several casualties among demonstrators. In the western city of Kermanshah, protesters set fire to a traffic police post, but no one was hurt in the incident, Mehr news agency said. State television reported that protesters burned down four mosques in villages in Savadkuh County in northern Iran on Monday. According to Reuters, Rouhani refrained on Monday from accepting responsibility of problems raised by protesters and he blamed his predecessor and also Iran’s long-time adversary, the United States for the government’s shortcomings. Rouhani, seen as a pragmatist who is at odds with hardliners, said: “People on the streets do not ask for bread and water, but for more freedom,” - implying that the protesters were not targeting his government but the more rigid establishment. On Tuesday morning, Trump followed up with another tweet: "The people of Iran are finally acting against the brutal and corrupt Iranian regime. All of the money that President Obama so foolishly gave them went into terrorism and into their “pockets.” The people have little food, big inflation and no human rights. The U.S. is watching!" Turkey said on Tuesday it was concerned by reports of people dying and public buildings being damaged in Iran. “We believe it is necessary to avoid violence and not succumb to provocations,” the Turkish Foreign Ministry said in a statement, adding that it hoped foreign intervention would be avoided. Meanwhile, the Russian Foreign Ministry was quoted by the RIA news agency as saying external interference was destabilizing the situation and calling it “unacceptable”. Iran and Russia are the main allies of Syrian President Bashar al-Assad, while the United States, Saudi Arabia and Turkey support rebel groups.